Dairy exports have a huge and growing impact on domestic milk prices. In the prior post, a review of dairy exports was promised as data became available. The February data on exports was released a few days ago and is examined in this post. The most important of these for Class III milk pricing is cheese exports. There have been concerns about international exchange rates and other international factors damaging exports, resulting in increasing domestic inventories and lowering the value of dairy products and thereby, milk prices. Toward the end of 2014, exports became more difficult and the lower January 2015 exports heightened these concerns. 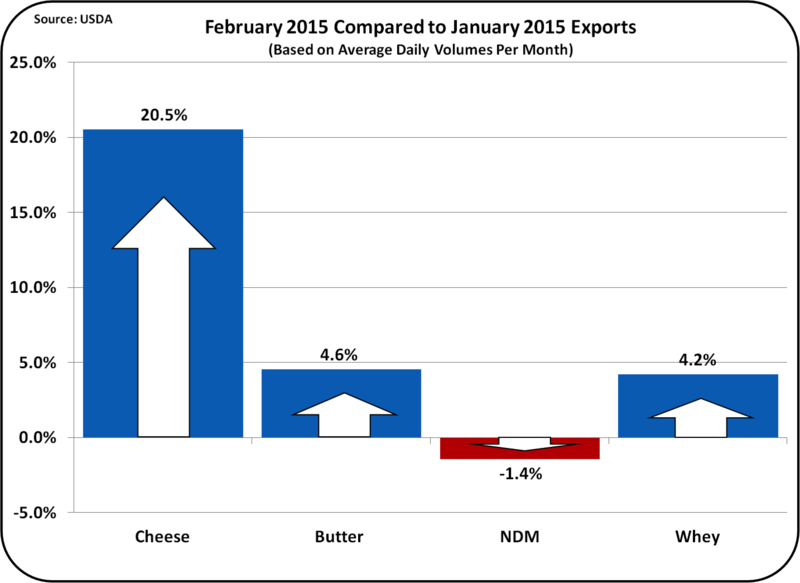 As can be seen below, cheese exports rebounded very nicely in February. The U.S. economy has recovered faster than the economy of most other countries. Because of this leading economic recovery, the USD, has strengthened vs. other currencies. Unfortunately, this makes U.S. exported items relatively more expensive and less competitive on international markets. Because more than 15% of U.S. dairy solids are exported, a decrease in dairy exports can cause domestic dairy inventories to balloon and force domestic prices down. The other major international exporters of dairy products are Europe and New Zealand. Because Europe has lost dairy exports to Russia, Europe has been actively seeking other dairy markets. The biggest shift in exchange rates has also been between the USD and the Euro, favoring European dairy product prices on the world markets. 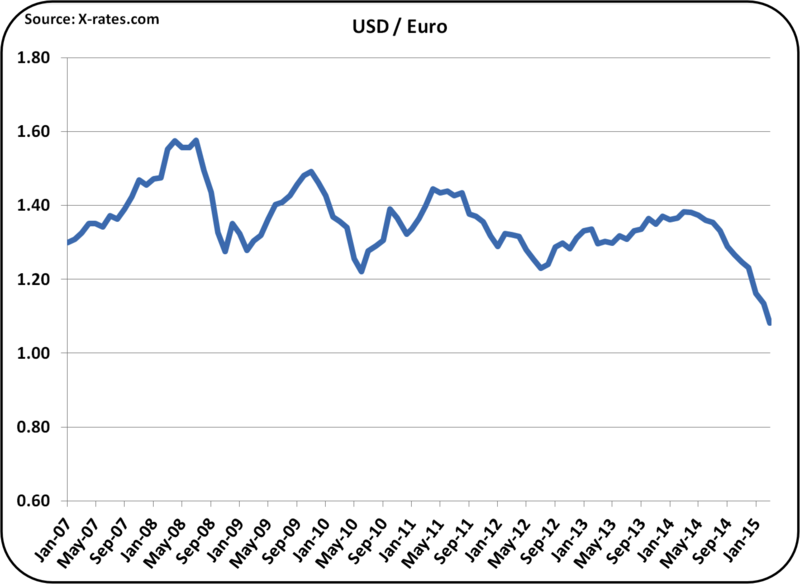 As shown below, the USD vs. the Euro has been trending toward a stronger USD for seven years, so this is not a new event. What is new, is the deeper plunge that has occurred in 2014 and early 2015. Since the beginning of 2014, the Euro has fallen over 20% in value vs. the USD. For European producers and processors, Cheese that sold for $4/lb., could now be priced at just over $3.20/lb. with the same producer and processor profits. European cheeses have an excellent reputation and are strong competitors. Cheese is not as commoditized as many other dairy products. Butter is pretty much butter no matter who you buy it from, and the same can be said about skimmed milk powder and dry whey. Because much of the exported cheese is sold as branded product, there is also a strong factor of brand loyalty in the international cheese markets. 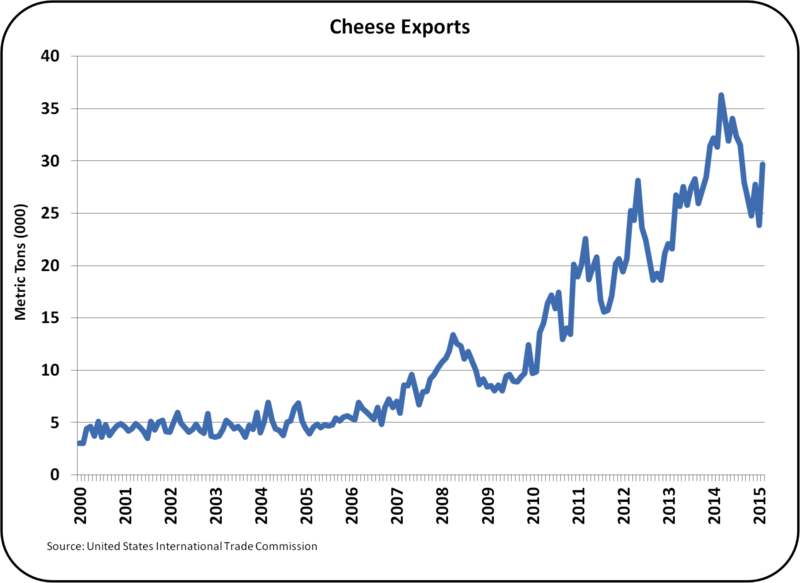 As shown below, exports of U.S. cheese have grown significantly since 2009. However, there is some plateauing in recent months. The year-by-year charts show a different view of cheese exports. The decline in cheese exports in the last three quarters of 2014 is clear. January 2015 followed this pattern, but February showed a significant reversal. Data for March will be very important, as it will establish whether February was just an aberration or is it the start of a new growth trend. An analysis of cheese exports reveals the strength and weaknesses of these exports. Mexico is by far the largest importer of U.S. cheese, representing about 25% of total U.S. cheese exports. These exports appear stable with no deterioration. South Korea is the second largest importer of U.S. cheeses, representing nearly 20% of U.S cheese exports in 2014. This market also remains solid. 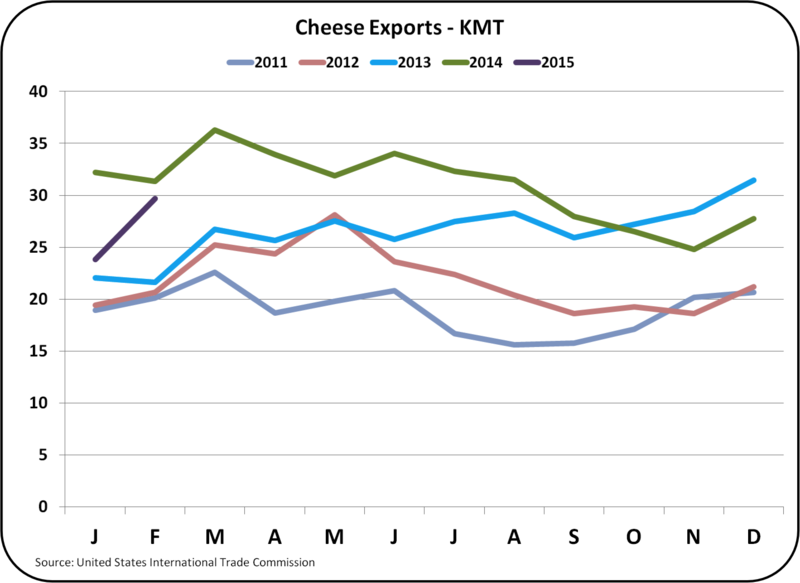 There has been some deterioration in other markets, but overall, cheese exports are stable for the time being. 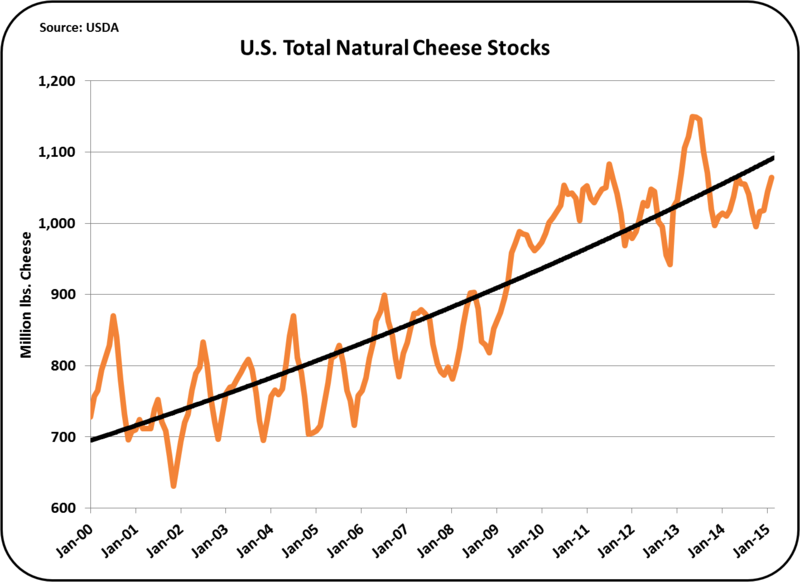 As mentioned in the prior post, there is no significant increase in U.S. cheese inventories. Nonfat Dry Milk/Skimmed Milk Powder (NDM/SMP) is a commodity. The U.S. remains the largest international exporter, but these sales are in jeopardy in term of volume and price. As the chart below shows, export volume is lower than the prior four years. In the past, Europe has been the largest exporter of this product, and is again making gains in volume growth in the international markets. Mexico is also the largest importer of U.S. NDM/SMP and historically has consumed 30 to 40% of U.S. export volume. Due to declining sales elsewhere, the stable Mexican imports now account for nearly 50% of U.S. exports. The Asia/Pacific Rim which had grown to be a significant U.S. market has now found better prices and availability elsewhere. As discussed in the July 16, 2014 post to this blog, NDM/SMP pricing impacts Class IV milk and in turn can impact Class I milk prices. This international market, which is very much price driven, will cause the U.S. exports of NDM.SMP to underperform until exchange rates shift to a weaker USD. Exports of whole milk powder, which has been an untapped market for U.S. exports, did grow nicely in 2014. 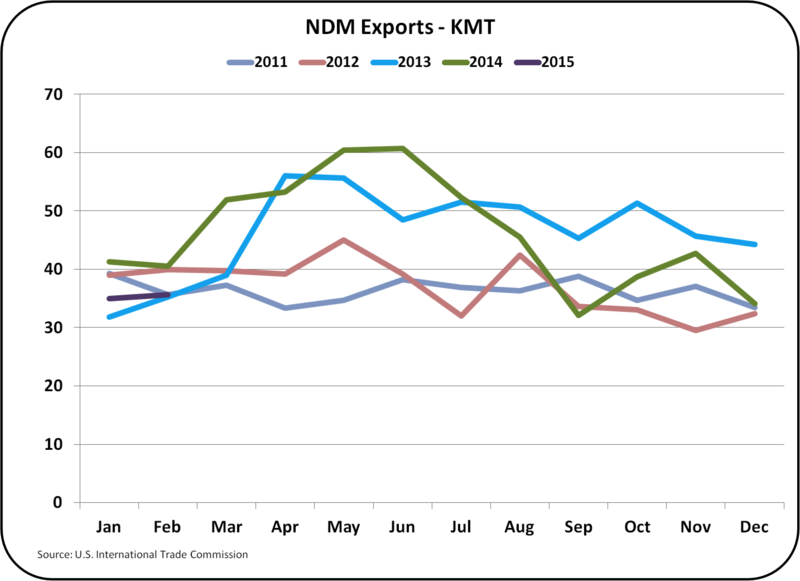 The combination of NDM/SMP and whole milk powder exports did show growth in 2014 over 2013, but the competitive international market still makes it difficult for powdered milk products exports to maintain volume or pricing for the foreseeable future. Dry whey is the basis for other solids prices, which is one of the three components making up the Class III price. Other solids has been contributing $2/cwt. to the Class III milk price. 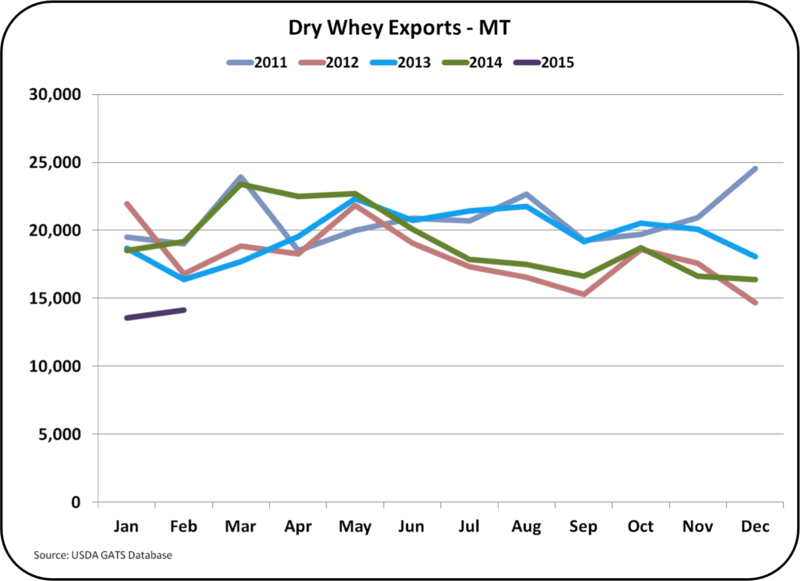 As shown in the chart below, dry whey exports are at a five year low. China imported 36% of U.S. exports of dry whey in 2014. This volume has been significantly reduced starting in late 2014, and has fallen faster in the first two months of 2015. Recovery will be difficult. As shown below, butter exports remain very low. As covered in the prior post, low churning rates have kept inventories tight and wholesales domestic butter prices remain normal. 2. February exports indicate renewed strength. The bad news is that the commodity dairy exports are seeing pressure on volume and pricing that will probably persist as long as the USD remains strong vs. the currencies of other dairy exporting countries. 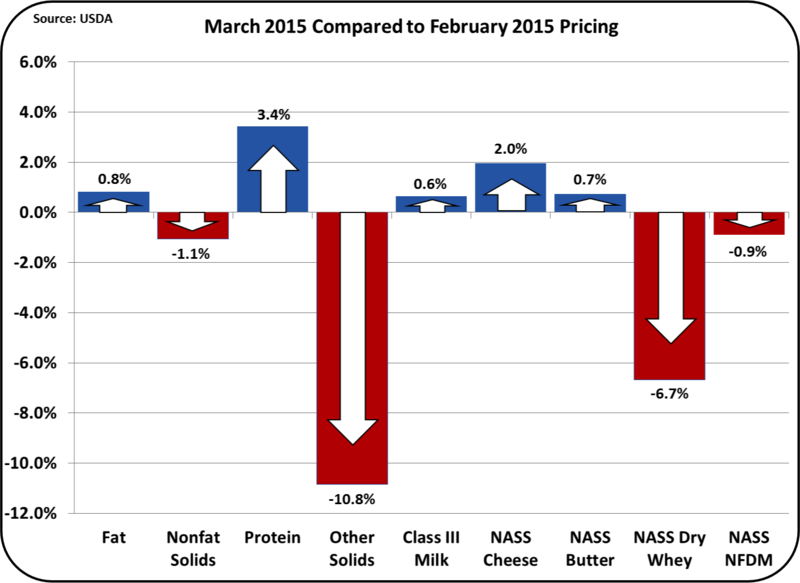 On April 1, 2015 Milk Class and Component prices were announced for March. Prices were slightly positive. The Class III milk price increased to $15.56/cwt. primarily based on an increase in the NASS wholesale price of cheese, which increased 2% to $1.58/lb. Milk butterfat also showed a slight uptick to $1.84/lb. and milk protein increased to $2.49/lb. Exports, which fell drastically in January, improved significantly in February. However, with a strong USD and increased international availability primarily from Europe, prices for dairy exports were down as compared to 2014. Inventories continue to be at reasonable levels and are not putting pressure on domestic prices. As shown on the graph of component price trends, the only down component was Other Solids. Other Solids pricing is driven by the price of dry whey, which is primarily an export item and pricing and volume are dependent on international factors. February export data will be available soon and will be covered in more detail in the next post to this blog. With 15% of dairy solids being exported, dairy exports are significant in size, and very volatile due to exchange rates and other international events. Cheese pricing is the most important commodity in the Class III milk price. (See the April 2009 post for a review of this important relationship.) There is fear that cheese exports will drop significantly and create a bubble in cheese inventories that in turn will cause lower prices. The current pricing of cheese reflects that fear. The chart below shows the drop in cheese pricing which started in December 2014. Throughout 2014, cheese prices were above $2/lb. until December. For the first three months of 2015, that price has dropped more than 25% to the $1.50/lb. range. 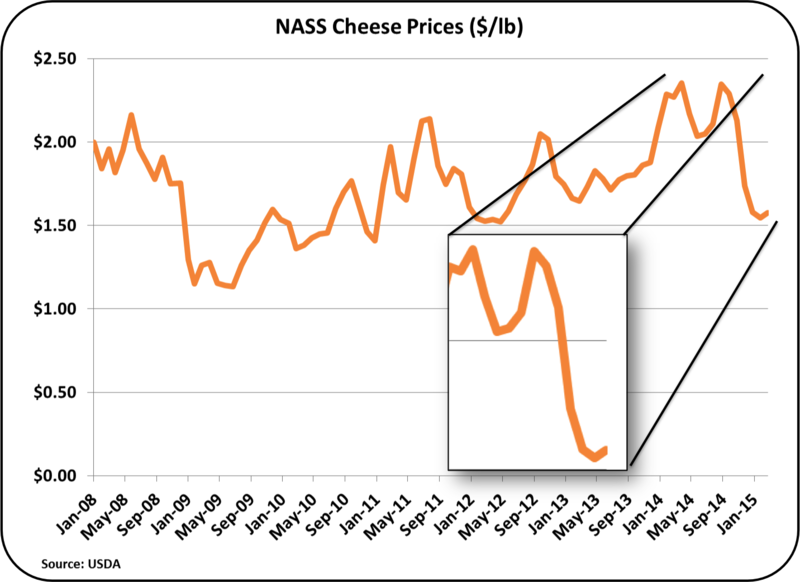 The futures price for cheese, as reflected in the CME data, is expected to increase for the remainder of 2015, approaching but not reaching the $2/lb. level of 2014. This will increase the Class III price due to the mathematical relationship between these commodities. In February, nearly 30 thousand metric tons of cheese were exported. This was down 5% from the prior year, but still was very strong. 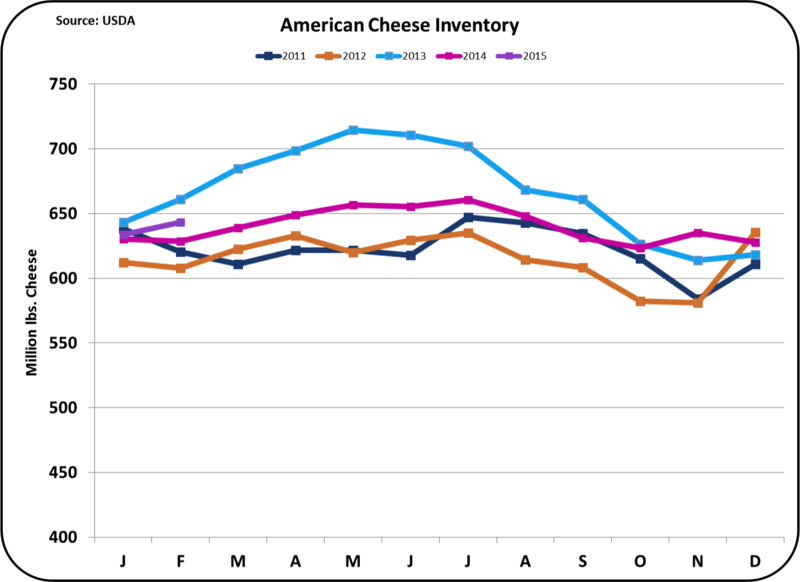 Inventories of cheese remain at reasonable levels compared to prior years. While there is a slight uptick in the inventories, they are not significant at this time. 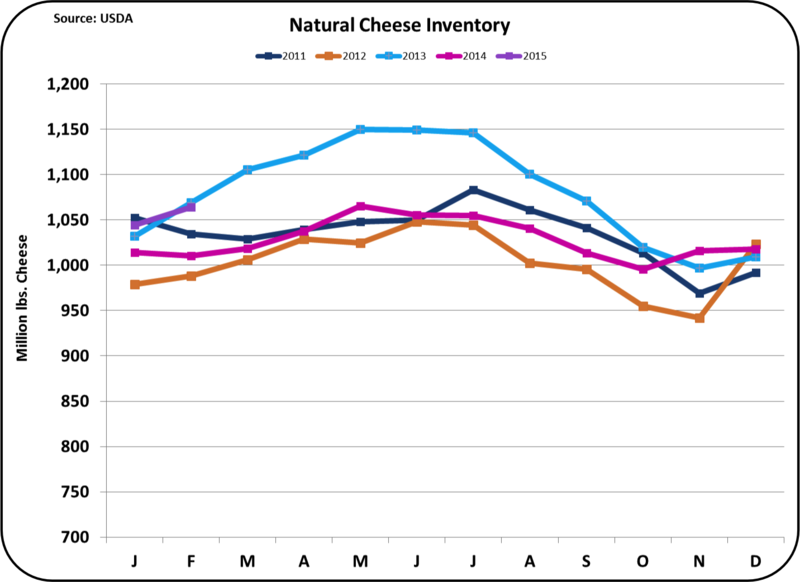 As a further view of cheese inventory levels, the chart below shows the trends over the last eight years. Current inventory levels remain below the long term trends. The domestic consumption cheese has a long history of growth and more recently, exports have contributed to cheese demand. With the growth in production and demand, an increase in inventories would be expected. To date, inventories levels remain within reasonable boundaries. Component prices that make up the Class III milk price continue to show the dominance of the financial contribution of milk protein. 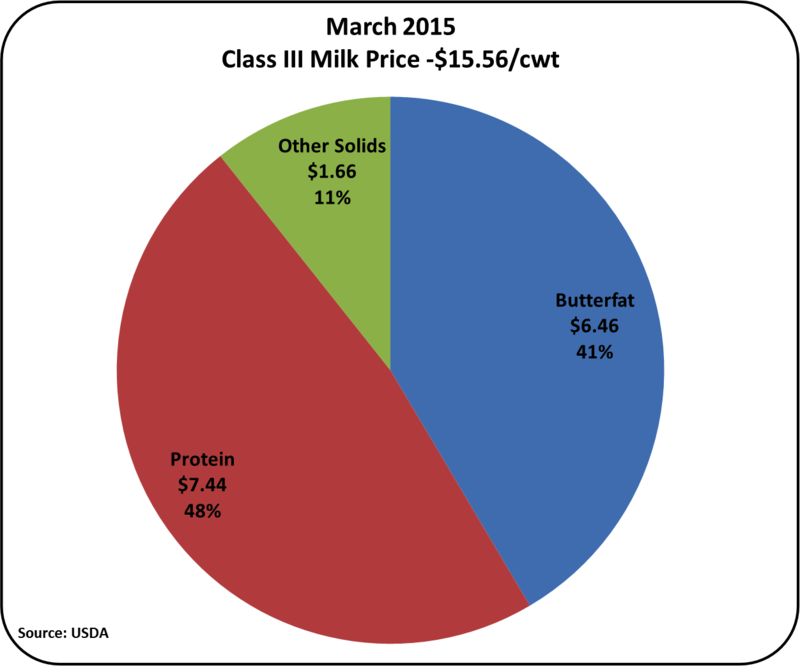 Milk protein contributed 48% of the value of Class III milk in March. Butterfat prices influence the price of milk protein. Butter has returned from the brief lofty highs reached in 2014, but remains over $1.50/lb. 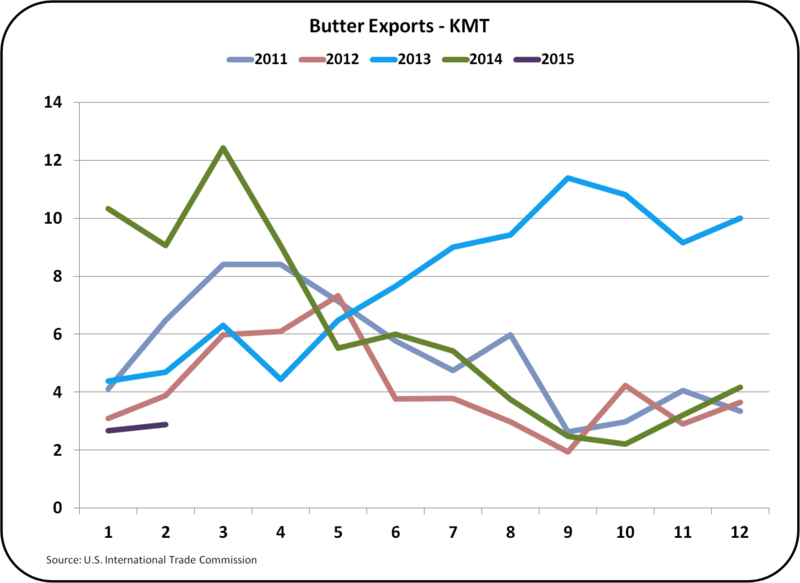 Butter inventories remain tight, as churning has not increased at all to help meet consumption and potential exports. 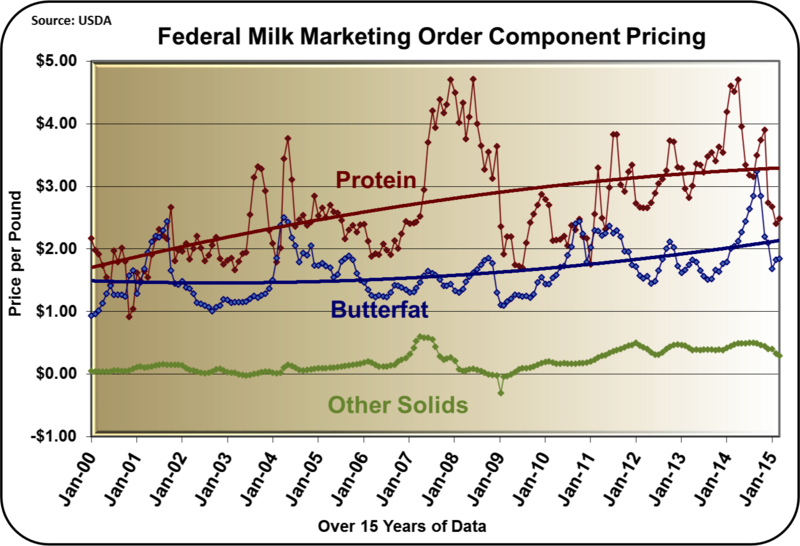 A higher butter price and therefore higher milk butterfat prices detracts from the value of protein. (See the August 10, 2010 post to this blog for a review of this relationship.) This is based on a valuation system that compares the value of butterfat in butter vs. the value of butterfat in cheese. As the value of butter goes up, the butterfat is relatively more valuable in butter than in cheese. Therefore, by formula, milk protein which is essential for cheese making is less valuable when butter prices are high. As discussed in prior posts to this blog, the 2015 drop in the Class III milk price appears to be mostly driven by concerns about lower cheese exports and ballooning cheese inventories. 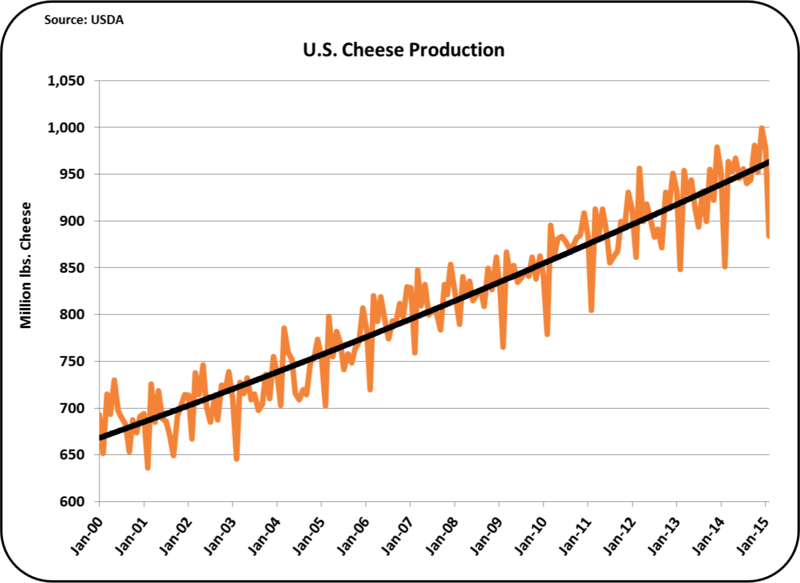 While cheese exports are down slightly, the concerns about bloated inventories are not founded. Cheese exports are down slightly, but still very healthy and based on February's export levels, cheese exports appear to be recovering their growth profile. Cheese and milk prices can be expected to increase from current levels as these concerns diminish. There will be a new post in the near future covering the new data available on milk exports and imports.